Pieter Weening (Orica-GreenEdge) was standing sweating in a tent in 30 degree heat under TV lights. He had just won the overall classification of the Tour of Poland and was on media duty. The poor Polish TV sport interviewer said, “So, you weren’t the favourite, but you won.” Weening’s eyebrows shot up. “Well, OK, if I wasn’t one of the favourites, then can you tell me who was? Who was the favourite?” Ouch. “Er…Cancellara?” suggested the hapless TV chap. Game, set and match to the 32-year-old Dutchman. While the locals were rooting for early race leader Rafal Majka, who started the day seven seconds clear of Weening, the vague time checks coming through suggested all was not well with the young Pole and that it was going to be very close at the finish among the top five GC contenders, who started the day within 27 seconds. 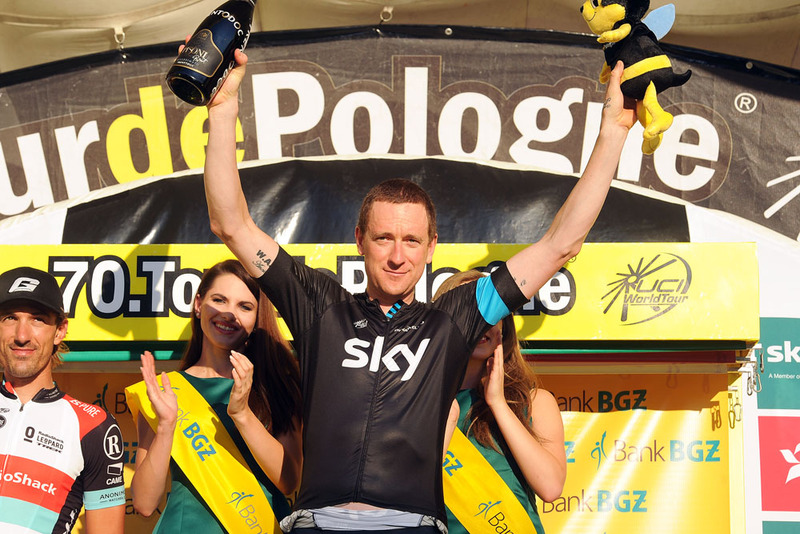 What turned out to be not to be a close run thing was Bradley Wiggins’ stage win. Wiggins, on that gold and black Pinarello Bolide, caught his minute man inside of three kilometres and rode a perfectly paced ride. Official time checks were shockingly absent but, Sky being Sky, they had prepared for that eventuality and had their own men at the roadside at strategic points. The fact that both Taylor Phinney (BMC) and Fabian Cancellara (RadioShack) started in front of Wiggins helped his cause. Realistically, after Marco Pinotti (BMC) finished, nobody was going to get close. Wiggins was a clear winner, putting 56 seconds into the Swiss. “Yeah, it was a brilliant time trial, great course, brilliant weather, everything was ideal for me. I’ve been training pretty hard for the past six or seven weeks for this event, so I wasn’t too surprised to beat Fabian (Cancellara). I was hoping the result would be like that because it confirms that the work I’m doing is good, it’s working,” said a relaxed Wiggins later. Well, you could say ‘relaxed’ but after a double round of Polish TV interviews and other media, he was scampering through crowds for a private plane to whisk him (can you whisk Wiggins? ), to whisk him back to Majorca to carry on training in the run up to the Eneco tour and his next appointment prior to the Tour of Britain and the World time trial championship. It was a good, balanced course – a roadman’s ‘hilly’ if you like and “the perfect course for me,” was Wiggins’s assesement. Which is to say that it didn’t simply go up the side of a mountain and neither was it a flat-out drag strip on dual carriageway. 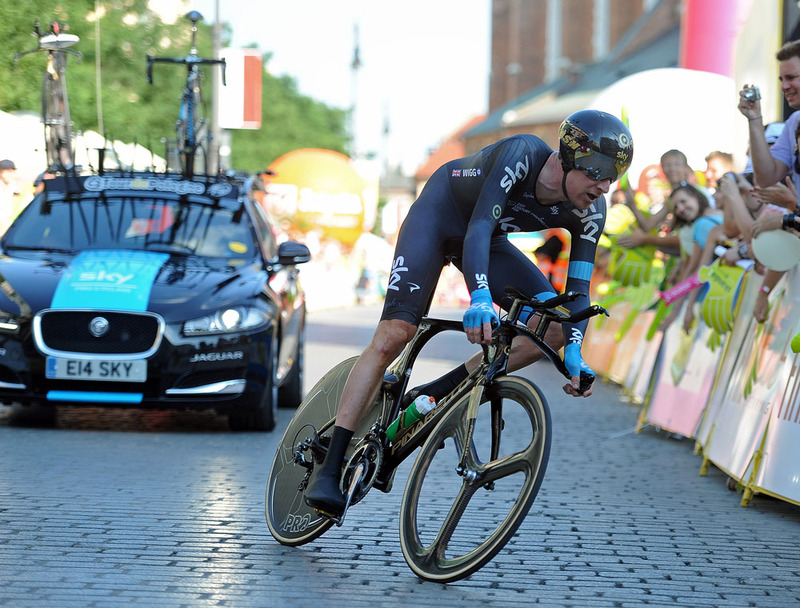 The opening 18km was demanding, with three climbs (two kilometres, four kilometres and two kilometres long) coming in very quickly succession from the start across the cobbled square in Wieliczka. It would have been easy to go out too hard and die on the faster, straighter rolling section up to the packed Market Square (Rynek Glowny) in Krakow. And that, alas, is what Sky’s other potential winner – GC man Sergio Henao did. The Colombian was ahead or level with his GC rivals at the halfway point but ended up slowest of the lot, falling from fourth overall to fifth in the process. 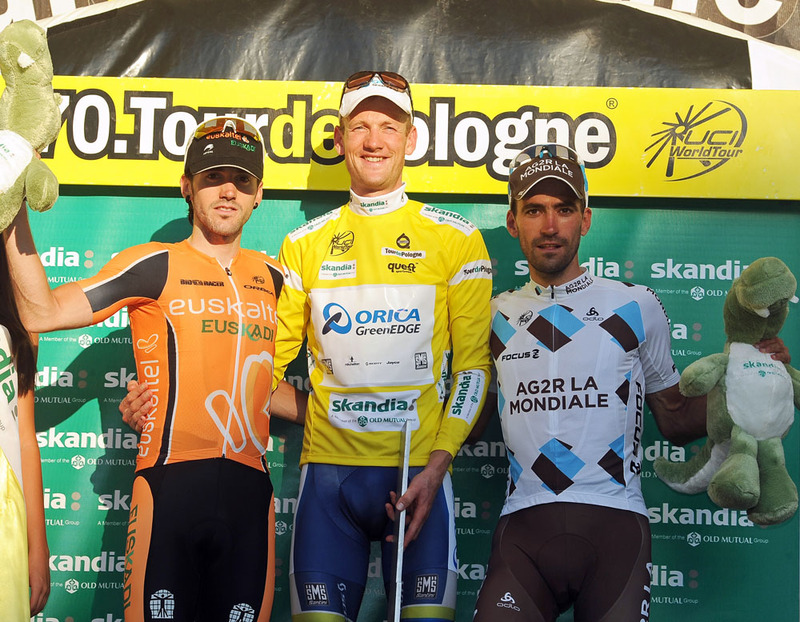 Overnight race leader, Ag2r’s Christophe Riblon, cursed his time trialling after the finish. Lathered in sweat in the 32 degree heat, the only word he could get out was a naughty one, midway between disgust and disappointment. “When am I going to get a time trial right?” was his rhetorical question as he slipped from first to third overall, 16 seconds behind Weening and three behind second overall Jon Izaguirre of Euskaltel, another ephemeral race leader. But, if Wiggins scored his first individual win since… Olympic time trial gold at London 2012, it was Weening who walked away with the biggest prize. “I took a rest period after the Giro and was preparing for a really good end of season,” said Weening. “I was a little bit surprised because it is my first race back since the Giro, but obviously I’m happy because it was a hard race. After the first stage in Italy I already started thinking about the GC because when I was up there in two mountain stages I knew I had a chance, the race was going to come down to the 10 or 15 guys who finished in the front in Italy. Next stop for Weening is the Eneco Tour, where he’ll cross paths with Wiggins again. 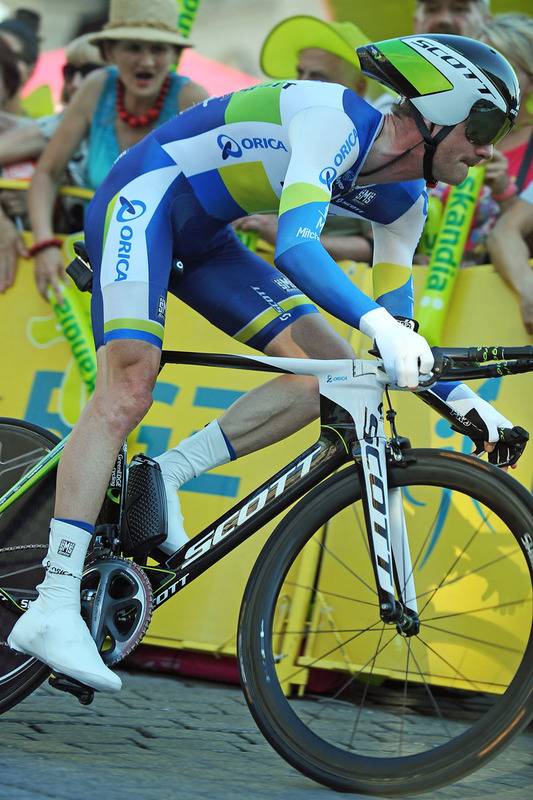 It’s a safe bet he’ll finish in front of Wiggins in the general classification and behind him in the time trial. Whether the Dutchman will win overall is another matter. The Eneco Tour has a mini Liege-Bastogne-Liege stage this year, which won’t quite replicate the Tatra mountains, but maybe they’ll be enough for Weening? “Yeah, it’s a funny stage of the year, some guys are just coming back to racing and if you are going well and have good focus, yeah, you never know…”.